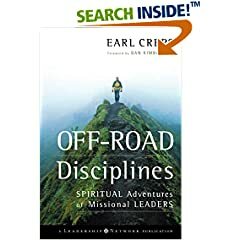 Off – Road Disciplines is a book by Earl Creps. Creps is the Director of Ministry Program and associate professor at the Assemblies of God Theological Seminary. Creps has served as a pastor, consultant and professor. His experience in pastoring a boomer, buster, and gen-x church each at different times uniquely qualify him to offer thoughts on the subject. Disciplines is about the idea that traditional, or “on road” disciplines need to be bolstered by things that take you off the beaten path and force you to meet God in unexpected ways. These ideas include the idea of reverse mentoring and harmony in the blending of differences. This discipline encourages us to look for guidance in places we might normally not. Meaning, looking beyond appearances, not caring if someone is young, old, pierced, tattooed, wrinkled, hairy, bald, green hair or gray, but rather listening to them, and their hearts, and to be continually learning from everyone. Seems I heard something once about man looking on outward appearance, but God looking at the heart. Chapter 8 in Disciplines speaks about the off road discipline of Harmony and the blending of differences. He gives 3 descriptions of the cross sections of most churches. In this, the builder generation style of traditional church is likened to that of Gunsmoke, the long running TV show. In this show, the Marshall Matt Dillon wears a white hat, and he rids the town of bad guys in black hats. Roles are clearly defined, and power and authority ensure that right triumphs over wrong. This style of church holds black and white values, and believes in authority, and the power it wields. In this, the baby boomer generation style of church is likened to that of the TV show Fraiser. In this show, two successful well-educated brothers try to order their life without much success. They push the boundaries of ethics and morality, all in the goal of reaching the prize. The tools they posses make them look smart, but it is not enough to ensure success. In this style of church, they are well ordered, and the end justifies the means. It was extremely successful, resulting in mega churches, and runs like a well-oiled machine, operating by the latest ideas and newest innovations in order to get the results they want. In the end, however, it leaves them lacking something in their life despite all their seeming success, and often it pushes them to limits that they did not want to go to. In this gen-x postmodern style of church, it is likened to that of the TV show Seinfeld. In this show about nothing, there is no defining characteristic, and each person does what is right to them. These ideas are the bedrock of postmodernism, and hold true in many gen-x churches. They hate the idea of looking like all the other churches and don’t want a strategy that comes in prepackaged box. They value exploration, and offer people a connection to God through the contributions of everyone. No one person has all the authority, and everyone’s contribution can be valid. Harmony is about getting all of these styles to work together. Experimentalists will write off the traditional and contemporaries as too stoic and rigid, and they will in turn be written off as too risky, putting to much in the hands of those who are not professionals. Everyone must realize that their way of doing church is simply that—a way. One way among many of embodying Christ in a specific context. The more of nonessentials we offer as a living sacrifice, the more our essentials occupy an appropriate position. No one is asked to change brands. None are asked to be what they are not. But everyone comes to the cross. This sums the idea of harmony. Harmony is blending, and the very idea of blending is the idea of putting two or more things together and making them into one. Harmony is the discipline that allows you to encounter God through someone that you seem to have nothing in common with, allowing you to experience God in ways that might otherwise never have. Off – Road Disciplines is a great book that encourages you to look for God in places you might otherwise not. I recommend it particularly for those in ministry. It continually provoked my thoughts, and made me see thing in a new light.